I feel that it is good to have clear definitions even for terms which are apparently simple. You'd be surprised how much understanding is gained by knowing exactly what is meant. This page is not meant for reading, but for reference. The definitions are simplified from textbooks and the Oxford English Dictionary. (Medicine) Of a disease or its symptoms: of short duration and usually severe. A collection of tissue in the wall of the nasal cavity. (Medicine) Altered reactivity of the body towards an antigen; especially hypersensitivity towards a particular foreign substance such as a type of food, pollen, or micro-organism. (Medicine) Impaired vision, without apparent change in the eye. The science of the structure of the body. (Anatomy) Situated in the front of the body, or nearer to the head or forepart. (Physiology) A foreign substance which, when introduced into the body, stimulates the production of an antibody. (Physiology) A protein produced in the body which reacts with a given antigen. (Medicine) A condition of distress accompanied by precordial tightness or discomfort. Difficulty of breathing; specifically such a condition characterized by attacks due to bronchial spasm and often of allergic origin. Incorrect proportion or harmony of the parts of a thing. A condition which is marked by severely limited responsiveness to other persons. General harmony between the parts of anything. Deprive of a relative or loved one by death. The emergence of young from the body of the mother. The mass of substance contained in the skull; cerebral substance. Of or pertaining to the bronchi or their branches. Inflammation of the mucous membranes of the bronchi. (Anatomy) Either of the two branches into which the windpipe divides. Also, any of the branching system of passages between the windpipe and the inner lungs. [From the story that Julius Caesar was so delivered.] Also called Caesarean section or Caesarean operation. The surgical operation of cutting the walls of the abdomen to deliver a child. A firm, elastic, semi-opaque connective tissue of the vertebrate body; gristle. The brain and spinal cord considered together. Of or pertaining to the brain. A disorder chiefly characterized by spastic paralysis due to brain damage before or at birth. (Concerned with or pertaining to) the diagnosis and manipulative treatment of mechanical disorders of the joints, especially of the spine. Of a disease: lingering, lasting; of slow progression and often gradual onset. Compare with acute. (Medicine) Branches of medicine involving the study or care of actual patients. An acute abdominal pain, especially one arising from the twisting, obstruction, or spasm of a hollow organ such as the intestines. Often a condition of early infancy, colic is marked by chronic irritability and crying. The action of becoming pregnant. Of or pertaining to the crown of the head. Of or pertaining to the cranium. each of twelve pairs of nerves arising directly from the brain and passing through separate openings in the cranium. The bones enclosing the brain; the bones of the whole head, the skull. Discharging of faeces from the bowels. The act of giving birth, or assisting at a birth. The identification of a disease from a patient's symptoms. A congenital condition causing intellectual impairment and physical abnormalities including short stature and a broad facial profile. Diploma in Paediatric Osteopathy. More information at Foundation for Paediatric Osteopathy. Difficulty in reading, or in understanding written words, without general intelligence being affected. The membrane of the middle ear, serving to transmit sound; the entire hollow part of the middle ear. A condition in which a person has intermittent paroxysmal attacks of disordered brain function usually causing a loss of awareness or consciousness and sometimes convulsions. Eustachian tube, the passage running through the temporal bone and connecting the middle ear and the nose, by which the air pressure is the same on both sides of the eardrum. An unborn human more than eight weeks after conception. Seeking relief in continual spasmodic movements. (Obstetrics) A large two-bladed instrument designed to encircle and pull upon the baby's head to assist delivery. The cranial bone forming the forehead and the upper parts of the orbits. Evidence of deteriorating condition of a fetus during labour. (Medicine) The reverse flow of gastric fluid into the oesophagus from the stomach. A condition in which a viscous fluid blocks the Eustachian Tube and impairs hearing, occurring chiefly in children as a result of infection of the middle ear. The branch of medicine that deals with the physiology and diseases of women and girls, especially of their reproductive organs. A continuous pain (usually dull and deep-seated) in the head. A half sphere / globe / ball. (Medicine) Involving the treatment of the whole person rather than the physical symptoms alone. (Physiology) Any of numerous compounds produced by specialized cells in a living organism to regulate the action of other cells. Especially of a child: unable to relax or be quiet. (Medicine) Of an individual: having an adverse bodily reaction to a particular substance in doses that do not affect most individuals. A lack of proportion or relation between corresponding things. A child during the earliest period of life after birth. Chronic inability to sleep; sleeplessness. Readily excited to anger or impatience; easily annoyed. A person without professional or special knowledge in a particular subject, especially law or medicine. An amblyopic eye in which underuse has contributed to its poor vision, especially with a squint. (Medicine) Treatment of a part of the body using manual action or dexterity. Of or pertaining to a mother or mothers. Of or pertaining to the science or practice of medicine in general; of or pertaining to medicine as opposed to surgery. The science or practice of the diagnosis and treatment of illness and injury and the preservation of health. A person with experience or training in assisting women in labour and childbirth. A recurrent throbbing headache, usually affecting one side of the head, often accompanied by nausea or disturbed vision. Fibrous tissue in a human or animal body that has the ability to contract, producing movement in or maintaining the position of parts of the body. (The arrangement of) the muscular system of a body; the arrangement of muscles in an organ or limb. The branch of medicine that deals with childbirth and the care and treatment of the mother before and after birth; the practice of midwifery. The back of the head. The occipital bone. The bone which forms the back and base of the skull and encircles the spinal cord. Either of two rounded knobs at the base of the skull which articulate the first vertebra. With reference to a baby's position during birth: Extending or proceeding in a crosswise direction; lying or running across. The canal leading from the back of the mouth, through which food and drink pass to the stomach; the gullet. The branch of dentistry that deals with the treatment and prevention of irregularities of the teeth and jaws. The OCC is the clinical arm of the Foundation for Paediatric Osteopathy, which includes education, outreach and research programmes. A system of healing based on the theory that some disorders can be alleviated by treatment of the skeleton and musculature using manipulation and massage. The branch of medical science that deals with childhood and the diseases of children. Gentle handling; specifically medical examination by feeling. Either of a pair of bones, right and left, forming part of the sides and top of the skull, between the frontal and occipital bones. (Medicine) An episode of increased acuteness or severity of a disease; a sudden recurrence or attack, a sudden worsening of symptoms. The science of the causes and effects of diseases. The basin-shaped cavity formed (in most vertebrates) by the fused right and left hip bones and pubis on each side, together with the sacrum and coccyx; these bones collectively, constituting the pelvic girdle. (Anatomy) Situated at the back; situated behind or further back than something else. Opposed (to) anterior. (Medicine) Situated in front of or about the heart. The condition or an instance of having a child or offspring developing in the uterus. Born or occurring before the end of the full term of pregnancy (but usually after the stage when the fetus normally becomes viable); specifically (of an infant) weighing less than 2.5 kg at birth. (Of a condition) Show itself, be manifest, appear, occur; (Of a patient) Come forward for or undergo an examination (with a symptom). Any of a large group of naturally existing complex compounds which form an essential part of all living organisms. Unable to rest; deprived of rest; finding no rest; uneasy in mind or spirit. (Anatomy) A triangular bone which is wedged between the two hip bones, forming the back of the pelvis and resulting from the fusing of (usu. five) vertebrae. It is from Late Latin os sacrum, translating Greek hieron osteon meaning sacred bone (from the belief that the soul resides in it). Designating or pertaining to the suture on the top of the skull between the two parietal bones. (Anatomy) A cavity within a bone or other tissue, especially within the bones of the face or skull, connecting with the nasal cavities. 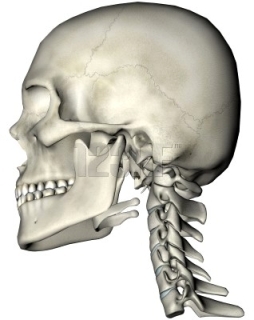 The bone framework or skeleton of the head, especially that part enclosing the brain; the cranium. (Medicine) Of the nature of a spasm or sudden involuntary contraction; characterized or affected by such symptoms or movements. The spinal column or backbone, also including the spinal cord. 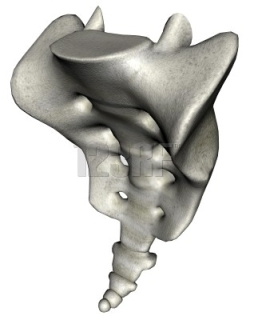 The series of connecting vertebrae that support and protect the spinal cord; the spine or backbone. The part of the central nervous system which is posterior to the brain, extending down the spinal canal and giving rise to the spinal nerves. A permanent deviation in the direction of gaze of one eye; defective alignment of the eyes. A state of affairs involving or characterized by strained effort, demand on physical or mental energy. A condition or circumstance that disturbs, or is likely to disturb, the normal physiological or mental functioning of an individual. (Anatomy) The junction of two bones forming an immovable articulation; the line of such junction; especially each of the serrated borders between the bones of the skull. Feed from the breast or teat. The hard internal framework of bones and cartilage supporting the body. The commonest variety of club foot, in which the foot is twisted inwards and downwards so that the person walks on the outer edge of the tip. A form of club foot in which the foot is turned outwards, so that the person walks on the inner edge of the foot. A form of club foot in which the foot is turned inwards, so that the person walks on the outer edge of the foot. An outburst of bad temper; specifically a fit of bad temper in a young child. Either of two bones forming part of the side of the skull on each side and enclosing the middle and inner ear. The lowest lobe in each cerebral hemisphere of the brain. (Medicine) Inflammation of the tonsils, caused by bacterial or viral infection. Either of two oval masses of tissue on either side of the throat. Also, the adenoids. (Anatomy) The suture between the frontal and facial bones. (Medicine) A physical wound. External or internal injury. Also a state or condition resulting from this, e.g. shock. The organ in female mammals in which the embryo develops and is nourished until birth; the womb. In full vagus nerve. Either of the tenth pair of cranial nerves, which supply the upper digestive tract and the organs of the chest cavity and abdomen. (Anatomy) Any of the bony joints or segments composing the spinal column. In plural: The spinal column. The fact or feeling of being called to undertake a specific career, function, or occupation; a divine call to do certain work; a strong feeling of fitness or suitability for a particular career. The work or function to which a person is called; a mode of life or employment regarded as requiring dedication. (Excessive) gas in the stomach or intestines. The organ in the body of a woman or female mammal in which offspring are carried, protected, and nourished before birth; the uterus.